This past week my living room went under the knife. It was totally unplanned, but all seem to fall into place. 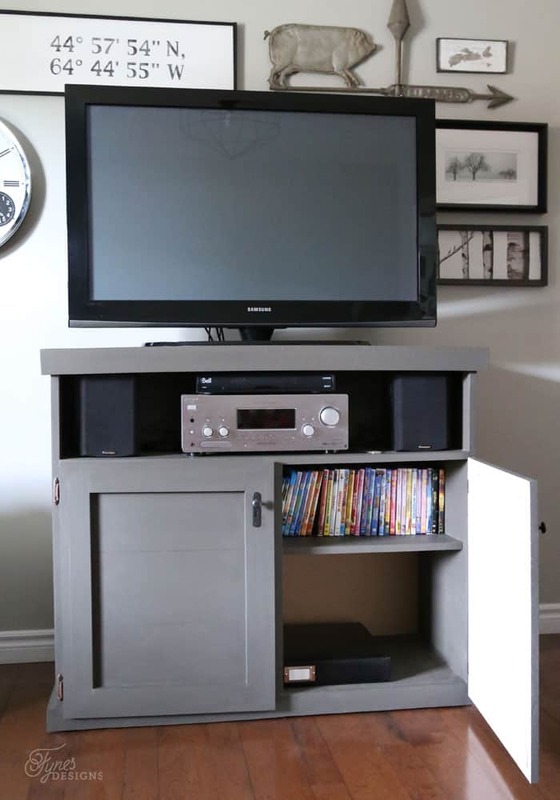 Today I’m sharing the DIY TV console I built that got the ball rolling. Quite a simple design, it actually resembles my sons bookcase I built last month (not intentionally). The best part, is I only had to buy one sheet of plywood, and used pieces from my scrap pile for the rest! Having the plywood cut at the hardware store will save you a bundle of time! 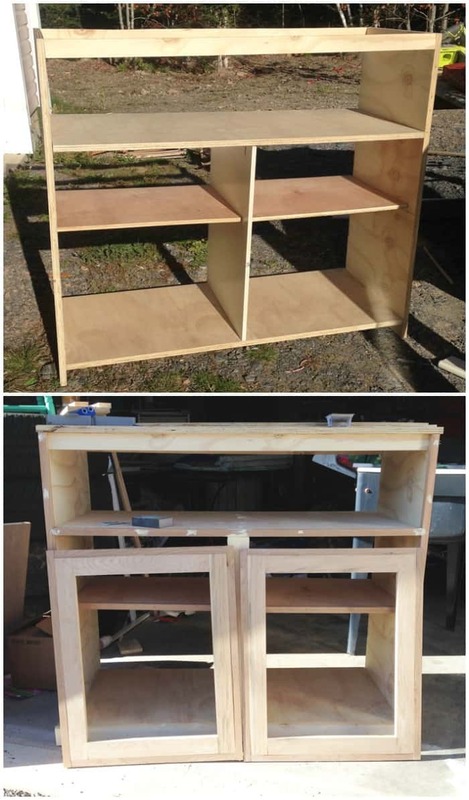 My finished TV stand measures 451/2″ long x 19 1/2″ deep x 38″ tall. However you can easily adjust the measurements to suit your own TV. I had to downsize our stand to better fit the space, the previous one was off scale for the size of the tiny room. 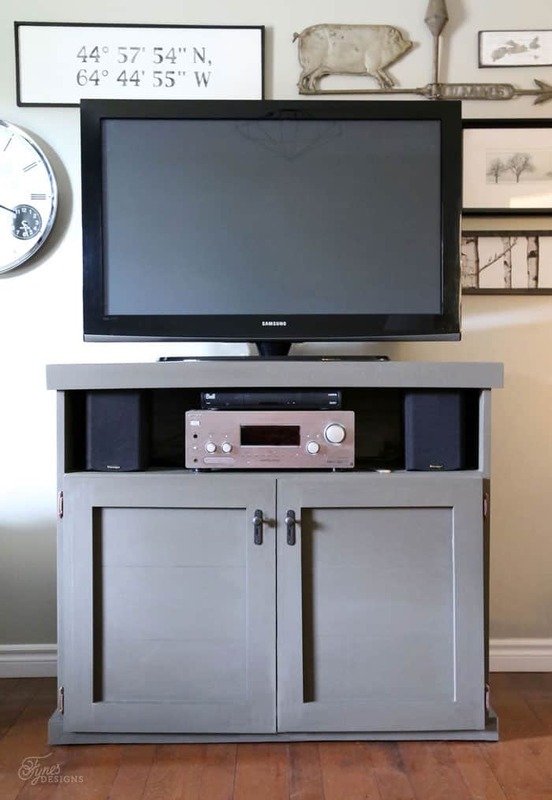 I loosely based my TV console off this plan from Shanty-to- Chic, they have great step by step directions for how to cut and assemble if you’re just starting out with DIY. My TV console differs as there is interior shelves, and the doors are outside the frame rather than inset. I also used a barn board style for the interior of the doors, which used up some scraps, and fit with the theme of the space perfectly. I used the Kreg Jig to hold the large pieces together. When adding the trim I used Elmer’s Wood Glue Max to hold, and nailed in place with my Ryobi Airstrike Brad Nailer. 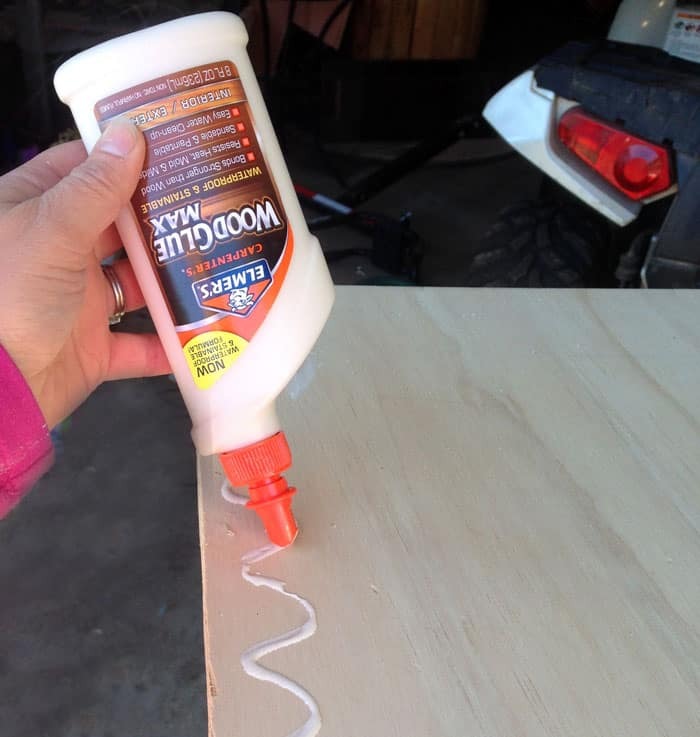 I chose this glue because it contains real wood fibres so staining, painting, and sanding are not an issue. Plus the bond is so strong, the wood will break before the bond does! The nail holes made from the brad nailer were filled with Elmer’s Carpenter’s® Color Change Wood Filler it dries white after going on purple!! 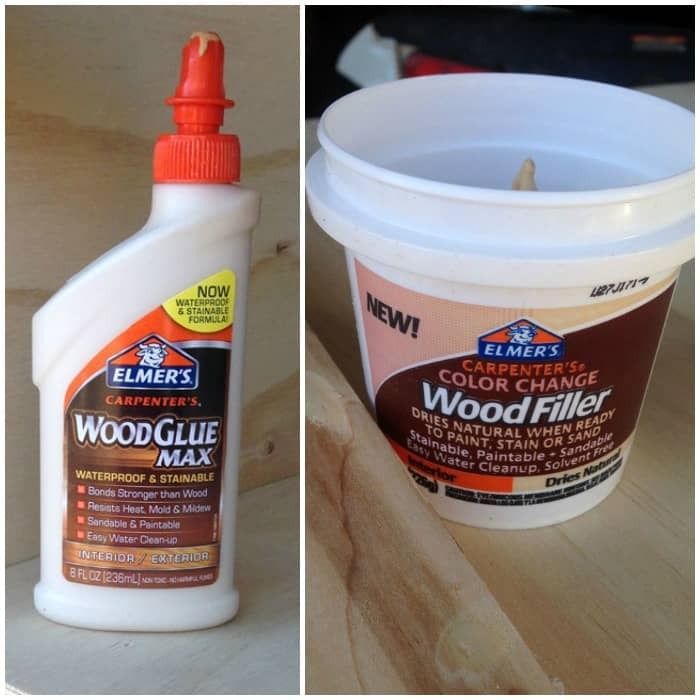 Once the wood filler turns white, you’ll know your wood is ready to be painted, or stained! I loved this filler, it was smooth and easy to apply, other stainable fillers I’ve used are gritty and difficult to spread. The large base cover works perfect to run over the filler after you apply just like having a putty knife on hand! I also loved that the Carpenter’s® Color Change Wood Filler didn’t shrink or crack… not that I had any uneven, cracked wood, or accidental screw holes to fill, never, not me (wink wink). I’m loving all the cabinet space. I made the top shelf the perfect height to store our DVDS, the opposite side has our DVD player which we don’t use very often. Obviously we have a little extra space that I’m sure will fill quickly! 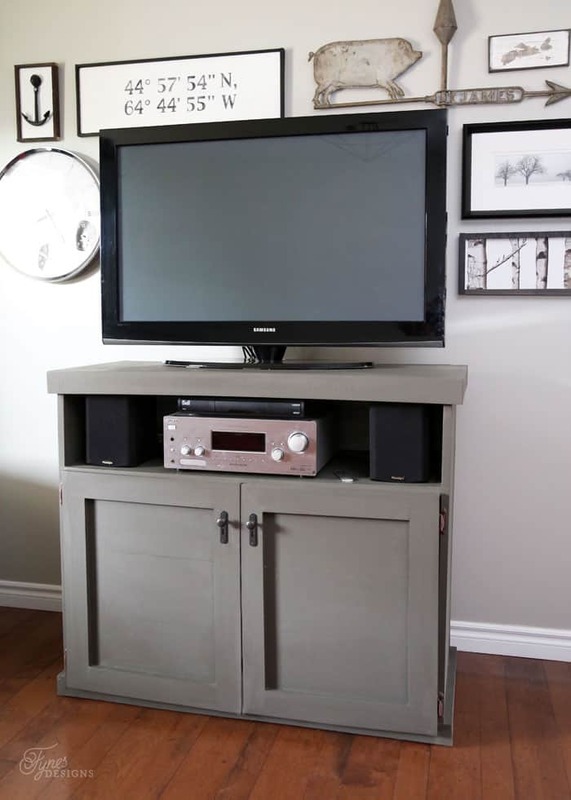 My little TV console isn’t perfect, but it was inexpensive to make (around $100 and a few scraps), it is sturdy construction, and I love the concealed storage space… did I mention we have 4 remotes?! Visit Elmers.com for all your adhesive needs in the workshop, craft room, and home, plus lots of great project ideas. Follow along on Facebook, Twitter, Pinterest, and Instagram, to get inspired to create! Disclosure: This post was sponsored by Elmer’s. All content, projects, and opinions are my own. Wow! Virginia – this is gorgeous. I am amazed at your skills. I also love how you staged the gallery wall around the cabinet. That turned out beautiful Virginia!! I love the colour, it goes SO well with your gallery wall behind (I want to make something I see there!!!) The price tag is great too, around $100?? Yesssss! Yes, I love the price tag, having the right tools and products really makes a world of difference! I’d love to see what you create! I love it! I’m thinking of building something very similar to serve as a bar cabinet in our basement media room. Yours looks amazing! Thanks, Its only my second piece of furniture, I still have so much to learn! What a great job you did making this TV console! I love building furniture… it has so much more meaning 🙂 Thanks so much for linking this up to the Bewitchin’ Projects Block party this week. Hugs, Lisa. I’m in need of a new one – teenagers go through furniture fast! I’ve done all kinds of diy but never considered building an one! Thanks for sharing on Throwback Thursday! Love the tv console. It lopks fantastic and how neat that you can talior it to your needs. Thanks, it is working really well in our space!